The recent financial crisis has once again stressed the importance of good corporate governance and corporate social responsibility in building trust in the European internal market. It has given rise to a discussion of whether a number of issues should be addressed through regulation or soft law at EU level. 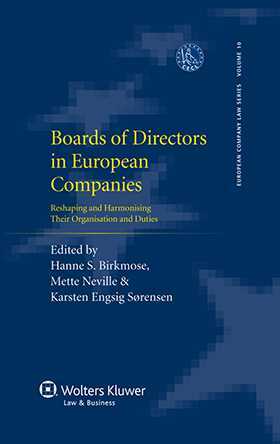 These issues relate in particular to the duties of directors in European companies as well as how the board of directors is composed and structured. directors duties in groups of companies. For policy makers, academics, practitioners and others committed to creating conditions favourable to sustainable growth, and responsible business behaviour, this book is an ideal starting point for investigation and action. Chapter 1. Introduction; H. Birkmose, M. Neville K. Engsig Sørensen . PART I. Duties of Directors. Chapter 2. Mapping Directors’ Duties: Strategies and Trends in the EU; C. Gerner-Beuerle, E.-P. Schuster. Chapter 3. Directors’ Conflicts of Interest: A Contribution to European Convergence; P. Krüger Andersen, D. Kristensen Balshøj. Chapter 4. Directors’ Duties in Groups of Companies: Legalizing the Interest of Group at the European Level; P.-H. Conac. Chapter 5. Directors’ Duties to Engage Shareholders; H. S. Birkmose . Chapter 6. The Risk Management Duties of the Board of Directors; C. van der Elst. Chapter 7. Directors’ Duties and Corporate Social Responsibility (CSR); B. Sjåfjell, L. Anker-Sørensen . Chapter 8. Boards in SMEs: Do They Enhance Good Governance? M. Neville . PART II. Organization of the Board of Directors. Chapter 9. Independent Directors: After the Crisis; W.-G. Ringe. Chapter 10. Active Owners and Accountable Directors; J. Lau Hansen . Chapter 11. Nomination of Members for the Board of Directors: A Swedish Version of Wag the Dog? J. Andersson. Chapter 12. The Europewide Movement towards a Gender Quota at Board Level; C. Teichmann, C. Langes. Chapter 13. Understanding the Role of the Board of Directors: What Is the Right Balance Between Managerial Oversight and Value Creation? J. A. McCahery, E. P.M. Vermeulen, M. Hisatake . Chapter 14. Disqualifying Directors in the EU; K. Engsig Sørensen . Chapter 15. An Overview of the Executive Remuneration Issue Across the Crisis; G. Ferrarini, M.-C. Ungureanu.